It's been awhile since I went that long without a post! Our apartment is nearly all set up now so today I'll show you a few pictures, and I will have more crafty stuff this coming week (plus, after the wedding, which is only EIGHT DAYS AWAY, a blogaversary giveaway because I missed it!). I'm so behind but I'll try to catch up! Sorry I haven't even been reading people's blogs. I've also been working full time for the first time and getting used to it, but I love it. Tiny but functional bathroom (also with new floors). Our shower had literally no water pressure the first week (when I say literally none, I mean drip, drip, drip) and it was fixed finally, so now showers are fantastically awesome. Anyway, I love this shower curtain from Target because it reminds me of Ty Pennington's Impressions line. I could have made my own shower curtain but there just hasn't been time, especially with the wedding. That's a project for another day, and I love this one anyway! I did gray because it's really hard to match anything else in a very yellow bathroom, haha! Sewing corner and desk! PROMISE I'll have neater pictures (I was/am still unpacking). Even since I took this picture a couple of days ago, things look neater. Organized my threads!! Woo! That's just about the only crafty thing I've been able to do, lol. Back soon - probably tomorrow! We are loving our new place and I will also post more pictures as we get settled! Woohoo! I'll likely be MIA for a few days this coming week as I get everything set up. This is our first place, so there's a lot to do, and now I'm working nearly full time. I promise I'll be back soon with pictures of my sewing space, more sewing of course, and wedding stuff!! 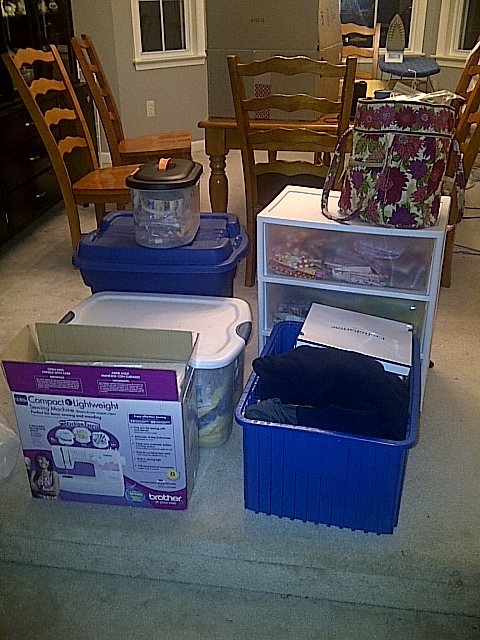 This week, I'm moving out (Saturday! ), getting used to a temporary full time schedule, and oh, I have a demo lesson tomorrow that I found out about today. No big deal. Oh, and, ya know, the wedding is 3.5 weeks away. I actually got a lot of sewing done this week but I can't show that quite yet! It's a Christmas gift :)However, I also FINALLY finished a t-shirt quilt for my best friend and maid of honor, Julie! She gave me these shirts from high school a year ago (it's been a few years since high school!!) and we also had gone to pick out fabric then. I finally decided to just work on it once a lot of the wedding crafts were finished this summer! She wanted straight line quilting and I was happy to oblige, especially because my cheap FMQ foot broke again (I really just need a machine that can handle all my crazy quilting, haha - working on it). For those who will ask, I do NOT use stabilizer on my T-shirt quilts - I like them soft! I'm in love with how cool the lines look! They weren't measured to be a certain distance apart. Glad to be moving, but it's sad packing up all of my (almost) 23 years. It's especially sad packing up my quilting stuff because I LOVE monopolizing the dining room!